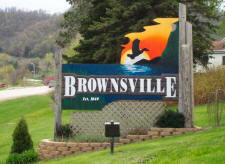 BROWNSVILLE is perched on the magnificent Mississippi and offers scenic beauty and some of the best fishing anywhere. The annual Lions Club Celebration in June each year showcases the town’s best qualities. 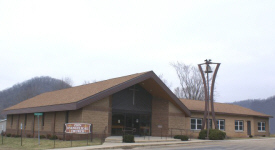 Visit historic sites including old brewery caves and Church of the Holy Comforter with its unique architecture. 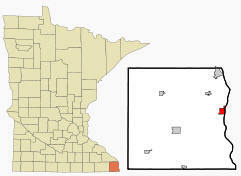 Brownsville is a city in Houston County, Minnesota. 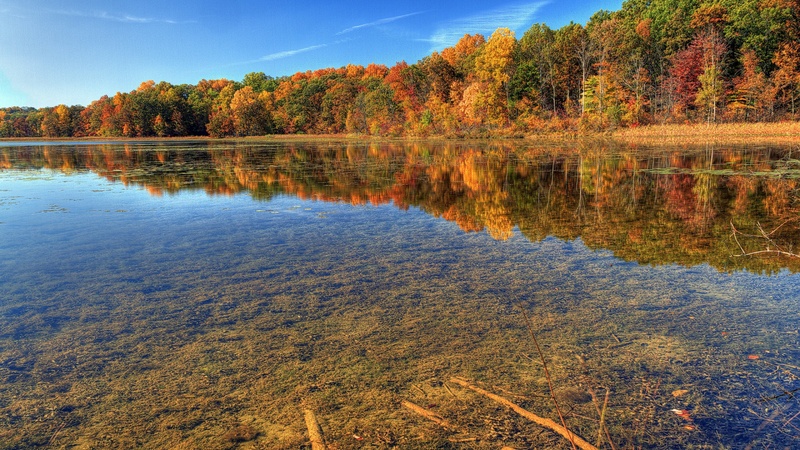 According to the United States Census Bureau, the city has a total area of 1.94 square miles (5.02 km²), of which, 1.75 square miles (4.53 km²) of it is land and 0.19 square miles (0.49 km²) of it is water. The elevation is 705 ft (215 m). As of the census of 2010, there were 466 people, 213 households, and 137 families residing in the city. The population density was 266.3 inhabitants per square mile (102.8/km2). There were 280 housing units at an average density of 160.0 per square mile (61.8/km2). The racial makeup of the city was 99.1% White and 0.9% from two or more races. Hispanic or Latino of any race were 0.9% of the population. There were 213 households of which 20.7% had children under the age of 18 living with them, 55.9% were married couples living together, 7.0% had a female householder with no husband present, 1.4% had a male householder with no wife present, and 35.7% were non-families. 27.2% of all households were made up of individuals and 10.3% had someone living alone who was 65 years of age or older. The average household size was 2.19 and the average family size was 2.62. The median age in the city was 47.6 years. 17% of residents were under the age of 18; 6.7% were between the ages of 18 and 24; 20.8% were from 25 to 44; 40.3% were from 45 to 64; and 15.2% were 65 years of age or older. The gender makeup of the city was 52.1% male and 47.9% female. The median income for a household in the city was $46,250, and the median income for a family was $51,875. Males had a median income of $32,426 versus $26,429 for females. The per capita income for the city was $20,442. About 1.5% of families and 3.5% of the population were below the poverty line, including 4.7% of those under age 18 and 9.4% of those age 65 or over. 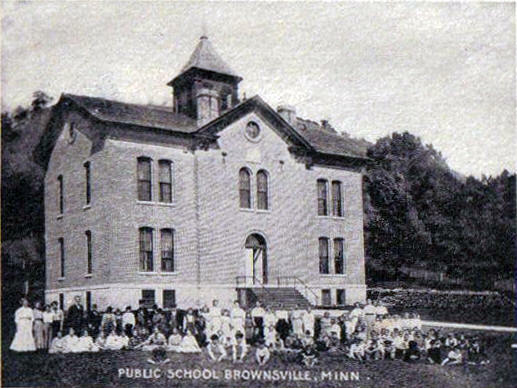 BROWNSVILLE Township, first settled in November 1848, organized May 11, 1858, was named for its steamboat landing and village, platted in 1854, by Job and Charles Brown, brothers, who came to Minnesota in 1848 from the state of New York. Biographic notes of both are in the MHS Collections, vol. 14. The city of Brownsville in sections 23 and 26, which is the oldest settlement in the county and was the first county seat, was incorporated as a village on March 2, 1858. When first settled, the community was known as Wild Cat Bluff. 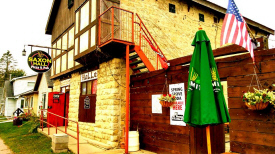 By 1870 the village had 50 businesses including a sawmill and a brewery, farming and lumbering being main industries. 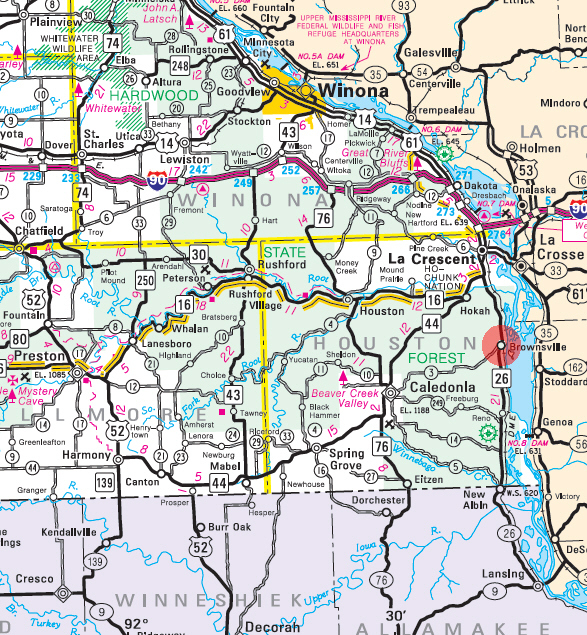 Its post office was established in Wabasha County and transferred to Houston County in 1852; it had a station of the Chicago, Milwaukee, St. Paul and Pacific Railroad in section 26. 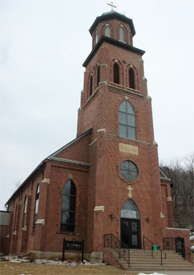 The Episcopalian Church of the Holy Comforter, built in 1869, has served as a religious center for almost 100 years. 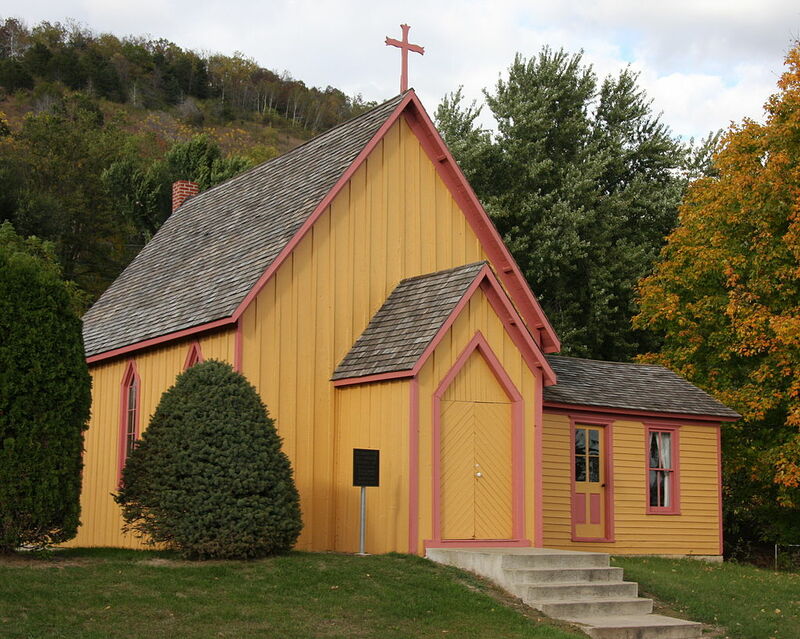 It is open by appointment throughout the year and the church is available for weddings and other appropriate functions for a nominal fee. Regular services have not been held in this historic 1872 church since 1963. Church is open by appointment. On the Mississippi. 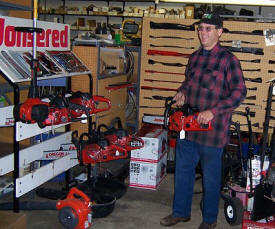 68 sites, primitive & electrical. 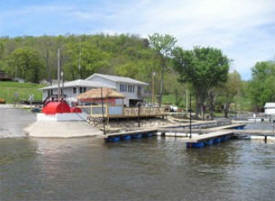 Fishing pier & boat ramp to Mississippi. 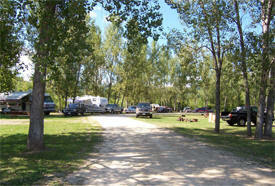 Sandy beach, central shower house, picnic tables, fire rings & picnic shelters. Riverfront sites, sanitary station, firewood & ice. Seasonal & monthly sites. Open May thru September. In Historic Bluff Country, 7 miles S of Hwy. 16 on Hwy 26 at Brownsville. 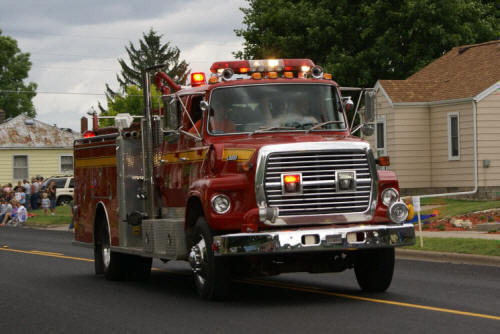 Our department sets a high standard in saving lives and property by staffing dedicated personnel, purchasing top-notch equipment. 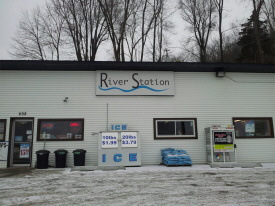 We continue to obtain training from Riverland College, S.E. MN EMS in Rochester, MN, Arrowhead Conference in Duluth, MN, Tri-State Ambulance, Franciscan-Skemp, and Gundersen Lutheran in La Crosse, WI. We also continue to train and fly with area helicopters. Our crew consists of First Responders, Emergency Medical Technician's (EMT's) Firefighters, and MN State Certified Firefighters. 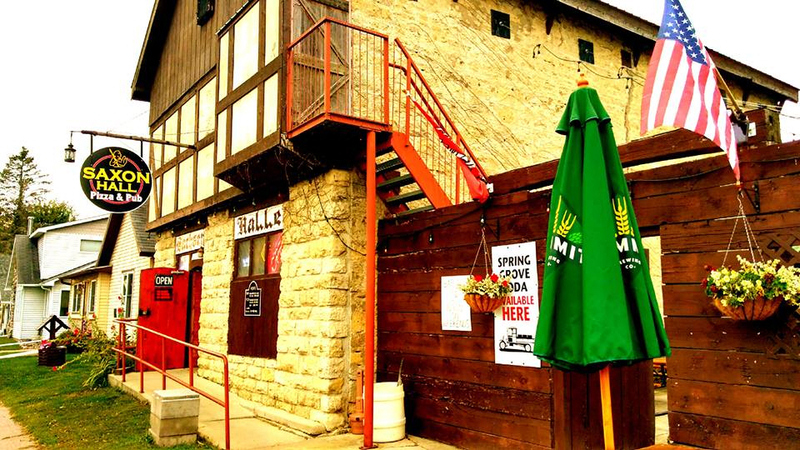 The Saxon Hall is a Pizza Pub located in Brownsville Minnesota in a 150 year old renovated stone building. We specialize in fresh, made from scratch pizza! 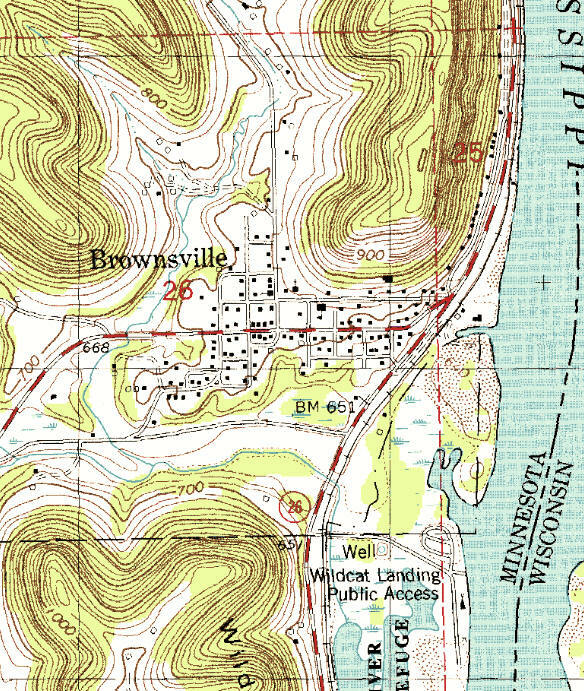 Wildcat Park and Landing is located on the Mississippi River south of Brownsville, Minnesota and features 52 campsites, 3 picnic shelters, 2 boat landings and one fishing pier. Water and electricity available on most sites. 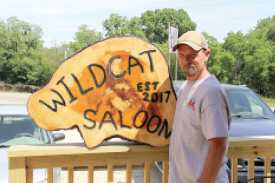 Wildcat Saloon is now open! Our grand opening is on June 3rd at 10am!! We're all looking forward to some drinks, giveaways and good company! At Willard’s Taxidermy, we understand what it means to harvest the animal of your dreams and how to make that memory last. We pride ourselves on helping you recreate that moment. All trophies are given great attention to detail in order to bring out the most natural look possible. Taxidermy is truly a modern art form. We believe in using the finest materials and applying our knowledge of reference in order to reproduce an accurate interpretation of your trophy. Our craftsmanship guarantees you a unique art piece that will help you relive the success of your hunt. Willard’s Taxidermy looks forward to working with you to create a work of art that you will be proud to display in your home or office. 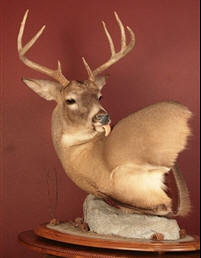 Our goal is to offer you the best wildlife art in the taxidermy industry.